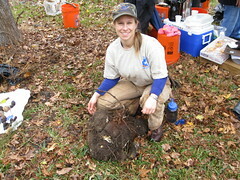 This photo was taken while I was volunteering in Gainesville's 9th Annual Great Air Potato Roundup on January 26. 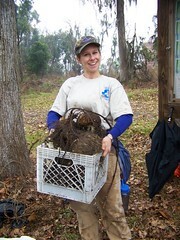 We were helping to clean up Wilmot Gardens on the University of Florida campus. The big brown thing in front of me is the tuber of Dioscorea alata, or "winged yam." It probably weighed close to thirty pounds! The vine is classified as an exotic invasive species, meaning that it spreads into natural areas and displaces native species. These vines can grow 30 feet or more in length -- you see the remains of the vine coming off the top of the tuber in the photo. As the vines grow, they produce air potatoes (also called "bulbils") that later fall off and can sprout new vines. The other type of invasive air potato that's common in this area is Dioscorea bulbifera. You can see a few of the light-colored, round bulbils on the white plastic bag to my left. The photo below shows what happens if Dioscorea bulbifera is left unchecked. Sure, it provides a lush tropical look, but trust me, you don't want this vine in your yard if you live here in Florida. It can grow to 60 feet in length, climbing up trees and shrubs or anything in its path, and can be just as all-consuming as kudzu. Here's one final picture from the air potato roundup, courtesy of Wendy Wilber. That's a bin of tubers I'm holding. I took oodles of shots while I was down in Ft. Lauderdale and I can't resist posting a few more. Here are a few of the MANY bromeliads that we saw at Fairchild. You can see some more of the Aechmea blanchetiana in the first shot. And what a striking color combination with the purple Tradescantia pallida and the silver-colored palm! I've read that Aechmea blanchetiana grows green in the shade and turns that brilliant yellow-orange when it's in full sun. I'd love to find some of these for my yard, but I worry they may be too tender for my area even if I covered them during cold spells. We'll see. Many of the bromeliads around the garden (like this red one) were just plopped into a giant hunk of limerock--very classic Florida. Bromeliads can survive like this because most of them don't rely on driving roots into the soil to take up water. Instead, they collect water in the natural cups that form where their leaves come together. Fairchild also had tons of fabulous cycads, more than 200+ species according to the Fairchild Web site. I'm only posting one shot now, because the rest are still on the work camera. And finally, I'm posting one shot of the plant with one of my favorite botanical names--Monstera deliciosa. Some people also call it Swiss cheese plant because of the naturally occurring holes in the leaves. Again, this is another true tropical plant that probably wouldn't survive in Gainesville's chillier weather. Today we hit the show floor at TPIE and saw some cool plants. The first thing that caught my eye at the sneak-peek breakfast we attended was a bat plant. This plant was different than mine because of two things: A) it was in bloom; and B) it was still alive. Yes, I'm sorry to say that my bat plant met an untimely death, but I don't think it was entirely my fault. 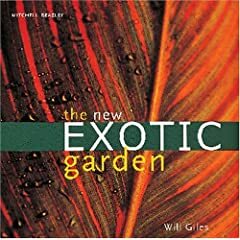 It had brown leaves and fungus gnats since the day I picked it up--it was only a matter of time before the roots rotted away. I tried repotting it, but it was too little too late. Another cool plant at the breakfast was the Alocasia spp. 'Sting Ray', which is being marketed under the new Hort Couture campaign. You can see a detail of the stingray-shaped leaf in the second photo. The stems are also striking, resembling Alocasia zebrina. We were really smitten with the Kerry's booth, as well as with their products. Kerry's is one of the largest orchid and bromeliad producers around. During the breakfast, one of their staff members said, "We don't sell--we sell fashion." This was definitely evident in their orchid displays, which were truly unique. Some orchids were in traditional yet sophisticated containers while others were in glass vessels that were lined with brighly colored gel media. The orange gel reminded me of the salmon eggs at the sushi restaurant The Kerry's folks say that the gel is great for orchids and cuts watering requirements from once a week to once every two or three weeks. Sounds like my kind of plant care schedule! And finally, I thought these bromeliad balls by Bromeliad Specialties were really clever! What a unique way to showcase these carefree plants. A group of us from work are down in Ft. Lauderdale for the Tropical Plant Industry Exhibition. This afternoon we were able to head down to the Fairchild Tropical Botanic Garden in Coral Gables, so I'm posting a few of the MANY photos that we took. The palm-like plant is indeed a palm, Iguanura wallichiana var. major, which is native to Malaysia. I was mesmerized by the way the light was filtering through the crinkly leaves. The yellow and green pods are from one of the most amazing plants on this planet, at least as far as chocolate lovers are concerned. The roasted beans from the pods of Theobroma cacao are the source of chocolate. Need I say more? I absolutely loved the bromeliad--Aechmea blanchetiana. I'd never seen a bromeliad with such amazing colored foliage. And the way the flowers contrasted with the foliage? Amazing. I'll have to do some research when I get back and see if this variety would be cold-hardy enough for Gainesville. And finally, I posted a shot of some of the cool Chihuly glass that is scattered about the gardens. This particular installation was our favorite, in part for its simplicity and for the way the linear red forms stretched upward against a solid green backdrop. Very pretty. That's all for now since we have a breakfast meeting at 7:30 a.m. I'll be sure to post more shots at a later date. Well, it finally happened. We got a freeze--the thing that tropical gardeners fear. Needless to say, many of my plants are looking pretty crispy right about now, including my coveted crinum lilies. I had read that they're cold hardy into the 20s, but that doesn't mean that their foliage can't get burned back. Chances are the plant itself is fine and will put out new growth in spring. I'm guessing the crinums will recover, since this is what typically happens with my Dwarf Cavendish bananas. Each time we have a hard freeze--this time my indoor/outdoor thermometer registered a 29.8 degrees as a low--the leaves get fried. But time after time, the bananas put out new leaves and are back to their perky tropical selves by mid-summer. Check back for updates on the crinum recovery process! Tip: Always wait until after the last freeze before pruning back any freeze-damaged plants. If you prune earlier, you might encourage additional damage if another hard freeze comes along.